By Scott Gilfoid: Liam Smith will be challenging WBO junior middleweight champion Jaime Munguia on July 21 in Los Angeles, California. Munguia-Smith will be the co-feature on the undercard of WBA super featherweight champion Alberto Machado vs. Rafael Mensah. Liam Smith’s career could implode if Munguia does to him what he did to Sadam Ali. Losing to someone as young as 21-year-old Munguia would make Smith look really bad and put things in perspective in terms of what’s left of the former WBO champion’s career. Despite Golden Boy Promotions CEO Oscar De La Hoya claiming that Smith is the best fighter in the 154lb division in 2016, the fact of the matter is he’s not the best or even close to being the best. Smith looks totally out of place with the No.1 ranking the WBO has him at. Smith would be over-matched against WBC junior middleweight champion Jermell Charlo or IBF/WBA champion Jarrett Hurd. Those would feast on a fighter like Smith. Munguia is the only guy that Smith has any real chance against in my opinion, and I don’t think he’ll do any better than Sadam Ali did. Munguia has a very good chance of ending Smith’s career with a quick knockout. Smith won’t be able to explain away a loss to Munguia. Losing to Saul Canelo Alvarez wasn’t that bad for Smith because he was beaten by one of the best fighters in the 154lb division. Getting beaten by Munguia is a different story. He’s very young and he still hasn’t made a name for himself yet the way Canelo had. Smith (26-1-1, 14 KOs) is a battle-tested former WBO 154 champion, who is looking to get a second chance to hold the title. The 29-year-old Smith has won his last 3 fights to get himself ranked No.1 with the World Boxing Organization. Smith beat Liam Williams twice to pick up the No.1 ranking with the WBO at junior middleweight. Hopefully Smith won’t drop out of the Munguia fight like he did with former WBO champion Sadam Ali. The train is going to leave the station if Smith can’t make it to the ring to challenge for the WBO title. Munguia (29-0, 25 KOs) will be making his first defense of his World Boxing Organization 154lb tile he won last month in stopping WBO champion Sadam Ali by a 4th round knockout on May 12 in Verona, New York. That was Ali’s first defense of his WBO title that he’d won last December in defeating Miguel Cotto by a 12 round decision. Liam Smith was supposed to be fighting Sadam, but he had an allergic reaction and had to pull out of the fight. 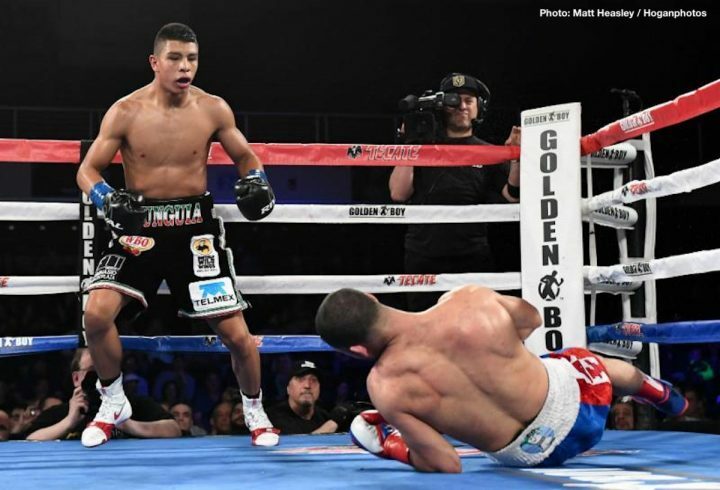 This gave Munguia, 21, the opportunity to step in and face Ali, and he blew him away in 4 rounds of a one-sided fight in knocking him down four times before the match-up was stopped. I hate to say it but I see Munguia wiping the deck with Smith, and beating him even easier than he did Ali. Smith will be easier because he’ll try and fight Munguia instead of running from him, and it’s going to end quickly for him if he does that.